At Lista’s Italian Cuisine we were known for our Lasagna but the menu also featured other stuffed and baked pasta dishes. One of my favorites was Baked Manicotti (manicotti al forno)… delicate pasta wrapped around creamy ricotta cheese, covered with sauce and mozzarella and baked until it was melt-in-your-mouth delicious! Manicotti is often found in Italian-American restaurants and may be called manicotti or cannelloni interchangeably. Both these dishes are prepared in a similar fashion, typically a sleeve of pasta wrapped around a filling and baked with sauce. Cannelloni (“large reeds” in Italian) are often sold in America as large dry pasta tubes that can be filled and baked — in Italy, the pasta is a typical blend of wheat flour, salt and water which traditionally was rolled into flat sheets, topped with filling, and then rolled up into a cylinder shape before baking. Cannelloni is from the Naples region of Italy, but types of cannelloni can be found in other countries as well. Manicotti (“little sleeves” in Italian), on the other hand, are traditionally not a true pasta dish but authentic manicotti is made with a crepe and would be called a crespelle in Italy. Authentic manicotti are made with an egg rich crepe batter cooked in a traditional crepe pan and then filled and rolled like a burrito. Manicotti can also mean “cooked hands” in Italian — from cooks burning their fingers while handling the hot crepes. In America true manicotti or crespelle are not commonly found on menus. Now for me. growing up, cannelloni was always made with a meat filling, while manicotti was always filled with cheese (sometimes with spinach added). At Lista’s we served a more traditional manicotti that was made with a lighter, egg based, crepe-like pasta. I can remember one of those Sunday afternoons when I was 12, working with Grandma Lista in the back kitchen, helping her make the crepes that would become those magnificent, cheese filled, delicacies we called manicotti. Although her original recipes are lost to time, I know it was basically 4 eggs, 1 cup water, 1 cup flour, and a pinch of salt — this was whisked together and then chilled. Grandma would then heat up her crepe pans and ladle some of the batter into each pan, give it a ‘swirl’ to evenly spread the batter and coat the entire pan, then briefly cook the crepe on one side (just until the tops were dry), then turn them onto sheets of waxed paper to cool. Once cooled, we would spoon the ricotta filling onto each crepe and roll them up to make the manicotti. The finished manicotti were then lined up in a baking pan that was coated with sauce, they were covered with more sauce and some Romano cheese and baked until hot and slightly browned, and ready to serve the hungry customers. Since those Lista’s days, I have learned many “tricks of the trade” to make cooking and life easier… one of those “tricks” is to buy fresh pasta sheets at the grocery store and use them instead of the traditional crepes to make my manicotti. With that in mind, the recipe here is using the short cut of pre-made pasta sheets — but feel free to try your hand at the authentic crespelle method. And of course, you can use the dry pasta tubes if you’re so inclined (Tip: use a pastry bag or zip-top bag to pipe filling into tubes) or possibly use a Gluten Free pasta sheet if that’s what your family prefers. 2. Coat a 9×13 baking dish with cooking spray and spread 1 cup pasta sauce in the bottom, set aside. 3. For the filling: in a large mixing bowl thoroughly combine ricotta cheese, Romano cheese, eggs, parsley, and black pepper, set aside. 4. To assemble: Cut pasta sheets in half to form 24 squares. For each pasta square spoon about 3 tablespoons cheese filling across center and rolls the pasta around filling to make a cylinder. Place manicotti, seam side down, on top of sauce in the prepared baking dish. Continue making manicotti and laying them side by side (touching but not crowded) until the dish is full. 5. Pour remaining pasta sauce evenly over the prepared manicotti and sprinkle with the remaining Romano cheese (and mozzarella cheese if using). Bake in the preheated oven for 45 minutes until sauce is bubbling and cheese is lightly browned. 7. Serve 3-4 manicotti per person topped with additional heated pasta sauce if desired. There you have it, Baked Manicotti alla Lista’s Italian Cuisine. This recipe is a basic cheese filled manicotti like we served at the restaurant. If you want to try something different add some chopped spinach to the cheese filling (Tip: one of those frozen boxes of chopped spinach, thawed and squeezed dry is just right) — or try topping the manicotti with a meat sauce made with 1/2 ground beef and 1/2 Italian sausage — another traditional touch is to bake the manicotti topped with a bechamel (white) sauce instead of tomato sauce… this is really nice when using the spinach and cheese filling. However you choose to make it, I hope you like the melt-in-your-mouth deliciousness of this fabulous Italian-American recipe. Pot Roast is one of those classic comfort food meals that brings back memories of my childhood. Every year my Mom, Doris, would make pot roast on my birthday (along with the very best sour cream chocolate cake, which I unfortunately misplaced the recipe — but when I find it I will post it). Pot Roast has been a part of the American diet since the mid 1800’s. Commonly known as “Yankee Pot Roast” in the Northeast, it was first made by those early American immigrants as a variation of the French dish boeuf a la mode (beef in the style) with influences of the German dish sauerbraten (sour beef). Both of these traditional European recipes call for a tough cut of meat (usually beef) that is slow cooked (braised) in liquid for hours to create a fork tender flavorful roast accompanied by a savory au jus or gravy. Sauerbraten is also marinated from 3-10 days in an acidic brine of vinegar, wine, and herbs before cooking — thus the name. The idea of using the tougher cuts of meat from a working animal’s shoulder or hip made sense in an economy that was struggling in those early years. Enhancing the dish with common root vegetables for added flavor and substance is just plain old Yankee ingenuity. The most common cut of beef used today for a Pot Roast comes from the chuck (shoulder) and is sold as the 7-bone roast (due to the shape of the bone resembling a number seven) or boneless chuck roast. Equally as popular is a top or bottom round roast (from the hip). The chuck roast tends to have more fat marbling than the round roast and is therefore moister after the long cooking process. In traditional European cooking a round roast would have been lardoned which is the introduction of fat (usually pork fat) into the meat using a long hollow larding “needle.” This allows the leaner cut to retain more moisture and therefore be more palatable. In American cooking, the readily available root vegetables such as carrots, onions, celery, parsnips, turnips, rutabaga, etc. are usually added to the pot for flavor along with herbs such as parsley, thyme or bay. Often potatoes are included to create a one-dish meal. My Mom typically made her Pot Roast in the oven* using the 7-bone chuck roast, carrots, celery, onions, and parsnips (which I love, but my wife hates). Usually Mom would add potatoes to the pot or sometimes serve the roast with mashed potatoes on the side. Unlike a stew, Mom typically didn’t thicken the pan juices into a gravy but would serve the au jus on the side so we could add it as we desired. Of course for me, who loves all things mixed together, I would spend lots of time mashing everything on my plate with a fork and stirring it together before eating it. I also liked to add butter to the mix, and top it off with lots of salt and pepper. *For this post I am using a slow cooker method because it makes more sense to our busy lifestyles. But you can use your oven or stove top if you prefer. 1. Remove roast from packaging and pat dry with paper towels. Season generously on both sides with salt and pepper. 2. Heat a large heavy skillet over med-high heat and brown the roast for about 3 minutes per side. Remove pan from heat and allow roast to rest while preparing the vegetables. 3. Peel, trim and cut vegetables as noted. If using potatoes toss with a little olive oil to prevent the cut sides from oxidizing. 4. Spray the inside of the slow cooker crock with cooking spray. Add the cut carrots, celery, onions and potatoes. Place bay leaves on top of vegetables, and then lay the browned roast on top. 5. Use 1 cup of the broth to deglaze the skillet and pour the liquid along with remaining broth over the roast. 6. Cover slow cooker and cook for 5-6 hours on high or 8-10 hours on low until meat and vegetables are fork tender. 7. Using tongs remove roast to a serving platter (slice against grain if needed) and arrange the vegetables around it. Cover with foil to keep warm. Meanwhile strain the cooking liquid through a mesh strainer and serve as au jus with the roast and vegetables. There you have it, Mom’s Classic Pot Roast (slow cooker method). Feel free to use which ever root vegetables you prefer — we often substitute rutabaga for the potatoes. If you prefer gravy over au jus then bring 3 cups strained cooking liquid to a simmer over med-high heat — make a slurry of 3 TBSP flour whisked into 3 TBSP cold water — while whisking hot broth constantly slowly drizzle in slurry until it begins to thicken — then cook for a couple more minutes and serve. Today I want to make a departure from my memories of Lista’s Italian Cuisine and write about a dish that I have become very fond of and often make at home: Thai Red Curry. Several years ago my wife and I joined some friends to celebrate a birthday at one of the popular local Thai restaurants. At the time I was familiar with the typical Americanized versions of Asian cuisines like Chinese take-out and Sushi — but had never tried Thai food. That day I was introduced to pa pia sod (spring rolls), tom kha koong (coconut soup), phat thai (stir fried rice noodle), and phanaeng gai (chicken curry). Since then we have frequented that Thai restaurant, and have tried many dishes, but my favorite is always one of the curries with coconut milk. So after eating curry time and again at restaurants; and after I did some research about ingredients and methods, I came up with my own version of Thai Red Curry (kaeng phet) that I can make at home and I think is pretty darn good. Admittedly, I have not endeavored to make the curry paste from scratch since there are some very good products available at the grocery store. For my family, we like that Thai cuisine is primarily gluten free, and can be vegetarian and paleo friendly (depending on what you eat). For us it can be a healthier choice when eating out and when looking for something different at home. Although some items on a Thai restaurant menu have added sugars (often used to balance out the spiciness) you can choose to leave out the sugar when making curry at home — which is great for those of us that want to eat sugar free. Since Thai curries are traditionally served with jasmine rice which has a higher glycemic index (73) you might be better off with a long grain white rice (50) or basmati rice (53) if you are watching carbs. Coconut Milk — I have been using Goya brand because I can find it without added gums and thickeners (which we prefer not to eat). I also choose to use coconut oil since I believe it has heart healthy benefits (this can be a controversial subject so I leave it up to you) plus I like that it adds to the coconut flavor in the curry. Red Curry Paste — This is vastly different than curry powder which has a primarily Indian flavor profile. I have been using Thai Kitchen Red Curry Paste which I find to have a good flavor and mild heat (the 4 oz jar would make 2 batches of curry). Fresh Garlic and Ginger — To amp up the store bought curry paste. Although Thai cuisine calls for galangal a close cousin of ginger but a truly different thing; I find ginger is much easier to find in the grocery stores. Fish Sauce — Made from fermented anchovies, this is one of those pungent, umani based products that only works in certain applications — however, without fish sauce the curry will not have that traditional Thai taste or aroma. Thai Basil — Thai basil is different than Italian basil or “sweet basil.” Thai basil has smaller thinner leaves and purple stems, and imparts a distinctive ‘licorice’ flavor which just adds to the curry’s unique taste. (In a pinch you can substitute sweet basil or a pinch of star anise). So now you should be ready to make Thai Red Curry. You can use a wok to cook this dish or use a large heavy, deep sided skillet (which I prefer). If you prep all the ingredients ahead of time and then start cooking… it literally takes minutes to finish this dish. Cooking the rice will probably take longer than making the curry. The recipe below is for Red Curry Chicken but you can use beef, pork, duck, shrimp, tofu, or just vegetables if you want. 1. In a large heavy bottom, deep sided skillet heat oil on med high, add pinch of red pepper flakes (if using), minced garlic and minced ginger and cook until fragrant. Stir in Thai red curry paste and brown sugar (if using) and cook for 2 minutes. 2. Add sliced chicken breast and sliced onion to pan, stir fry until chicken turns white about 5 minutes. 3. Pour in coconut milk, stir to incorporate with curry paste and bring to a simmer. 4. Add bell pepper, zucchini, green beans, and Thai basil to pan and stir to cover with curry sauce. Stir in fish sauce. Cover and simmer for 5 minutes. 4A. Optional — if you want sauce to have thicker consistency, add corn starch and water mixture and simmer another 5 minutes or until thickened. 5. Taste sauce and if needed adjust for seasoning with salt and pepper to taste. 6. Serve over hot cooked rice and garnish with lime wedges if desired. There you have it, my version of Thai Red Curry Chicken (kaeng phet gai). This recipe is for a mild-medium red curry — if you like your curry hot and spicy add more curry paste or a couple sliced red chilies with the seeds when cooking. Taste and adjust to your liking. If you prefer a protein other than chicken, try beef sirloin (partially frozen) that is thinly sliced across the grain… or thinly sliced pork loin… or peeled and deveined raw shrimp (added at the end with the vegetables). You can also use firm tofu either fried or unfried… or add extra veggies like eggplant, squash, mushrooms, potatoes, carrots, broccoli, etc. In our home like many Italian-American homes we ate lots of breaded cutlets. Whether it was veal, chicken, eggplant, or pork (a particular favorite of my Dad’s) anything breaded and fried was especially delicious. In Italy, cutlets or cotoletta are slices of meat (usually milk fed veal) that are breaded and fried in butter or olive oil. Traditionally cotoletta was cooked and served with the rib bone still attached, while scaloppine was served boneless. Today many dishes are prepared with a thinly sliced or pounded boneless cutlet called cotoletta a orecchio di elefante (elephant ear cutlet) — and chicken is now as popular as veal. While we often think of Italian cutlets being served alla parmigiana with a tomato sauce and cheese, there are other popular preparations that involve a butter sauce (milanese); wine based sauce (scaloppine), or lemon based sauce (piccata). In fact, parmigiana (covered with tomato sauce and cheese) was originally from the Campania region and traditionally made with eggplant (melanzane) not veal or chicken as is popular today in America. 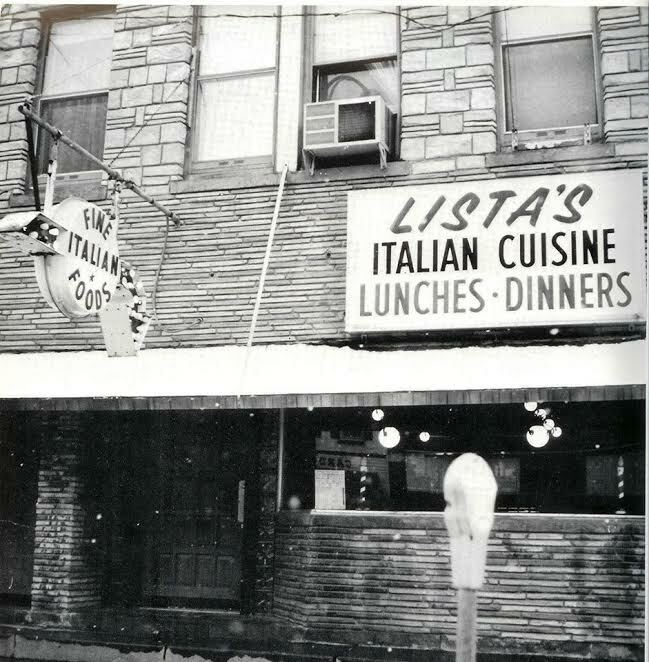 During the Lista’s Italian Cuisine years, one of my favorite meals on the menu was veal cutlet alla parmigiana with a side of… french fries! (Yeah, like I’ve said before I had a definitely more American palate in those days.) Of course veal cutlet was one of those meats that was too pricey to feed a family of seven, so at home we more often ate chicken or pork cutlets. When I raised my own kids it was Italian Chicken Cutlets that was the hands down favorite. Whether served alla parmigiana with sauce and mozzarella — or as a more mundane entree served with potato and vegetables, the kids loved it when breaded chicken was on the menu. And the great thing about breaded cutlets is that you can use a less expensive cut of meat and through the tenderizing and breading process elevate and extend it to make a really nice presentation. It seems whenever I buy boneless skinless chicken breasts at the supermarket, they are gigantic! (I wonder what happen to all the normal sized chickens.) So, when making chicken cutlets I typically buy the humongous breasts and slice them in half through the middle (i.e. butterfly them) so I have 2 breast shaped pieces. Then I place them in a gallon size heavy duty zip-top bag and pound them out with my meat mallet until they are uniformly between 1/2 inch and 1/4 inch thick. This ensures the cooking process will be quick and even. As I’ve written before, I really don’t like to deep-fry anything at home, so I like pan frying these cutlets. Make sure you use a deep, heavy bottomed skillet or frying pan when cooking with hot oil. Allow the oil to reheat between batches so your cutlets don’t get greasy. To avoid burns, use tongs to place the cutlets in the hot oil, turn them, and remove them. I find it best to drain the cutlets on a plate covered with clean newspaper which absorbs the excess oil but doesn’t make the cutlets as soggy while they wait. And I don’t make many breaded items anymore since we are basically Gluten Free all the time, but I can still make the cutlets using GF bread crumbs (store bought or homemade) — not exactly the same texture as wheat flour bread crumbs but it works if you need to avoid gluten. To make home made gluten free bread crumbs use 4-6 slices gluten free bread and toast them until golden brown. Place on paper towels and allow to cool completely. Break the toast up into pieces and place in bowl of food processor with metal blade. Pulse until uniform fine crumbs are achieved. Place in a mixing bowl and add 1-2 tsp Italian Seasoning and 1/4 tsp garlic powder — combine thoroughly and use as you would store bought crumbs. Note: If your family likes chicken fingers and chicken nuggets, you can cut the breasts into strips or chunks and follow the same breading and cooking techniques to make them homemade. 1. Place each breast on a cutting board and using a long sharp knife, held parallel to cutting board, butterfly the breast by making a lengthwise cut through the entire breast leaving two even pieces. 2. Place each cutlet in a large zip-top bag and using a meat mallet (flat side) on a flat surface, gently pound the cutlet in the bag until about 1/2 to 1/4 inch thick. Continue until all 4 cutlets are uniform size. 3. Add flour to another zip-top bag and shake each cutlet to lightly coat. Placer on platter in refrigerator until ready to bread. 4. In one shallow bowl scramble the eggs with 2 TBSP water. 5. In another bowl place the seasoned bread crumbs mixed with Romano cheese (if using). 6. Dip each floured cutlet in the egg wash and then place in the bread crumbs. Press the cutlet into the bread crumbs; turn over and press into the crumbs on other side. (Repeat pressing into crumbs on both sides until evenly coated.) Remove breaded cutlet to a platter or rimmed baking sheet. Continue same process with remaining cutlets. 7. Heat the oil in a deep, heavy bottomed skillet on medium heat until oil is shimmering and a drop of water sizzles. 8. Using tongs, gently place each cutlet in the hot oil (don’t crowd the pan) and cook on one side for about 3-4 minutes. Gently turn over with tongs and cook on other side for another 2-3 minutes. Test cutlet with an instant read thermometer to make sure they have reached at least 165 degrees F. Remove to a paper lined plate to drain. Continue to cook until all cutlets are done. 9. Serve cutlets plain or topped with a sauce of your choice. There you have it, Italian Chicken Cutlets, a Lista family favorite! These cutlets are so versatile, pretty quick to make, and sure to please almost everyone. Cutlets can be served as an entree or sandwich… they can even be cut into strips to top a dinner salad.